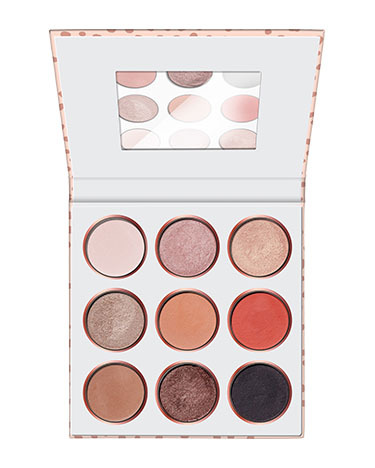 be you tiful eyeshadow palette has a rating of 5.0 stars based on 2 reviews. "INGREDIENTS: TALC, MICA, SYNTHETIC FLUORPHLOGOPITE, ETHYLHEXYL PALMITATE, MAGNESIUM STEARATE, HYDROGENATED POLYISOBUTENE, SILICA, DIMETHICONE, POLYETHYLENE, PTFE, TOCOPHERYL ACETATE, MAGNESIUM MYRISTATE, TRIETHOXYCAPRYLYLSILANE, O-CYMEN-5-OL, PENTAERYTHRITYL TETRA-DI-T-BUTYL HYDROXYHYDROCINNAMATE, PHENOXYETHANOL, MAY CONTAIN/[+/-]: CI 16035 (RED 40 LAKE), CI 77007 (ULTRAMARINES), CI 77163 (BISMUTH OXYCHLORIDE), CI 77491, CI 77492, CI 77499 (IRON OXIDES), CI 77891 (TITANIUM DIOXIDE). AND/UND INGREDIENTS: TALC, SYNTHETIC FLUORPHLOGOPITE, MICA, ETHYLHEXYL PALMITATE, MAGNESIUM STEARATE, HYDROGENATED POLYISOBUTENE, SILICA, DIMETHICONE, POLYETHYLENE, PTFE, TOCOPHERYL ACETATE, MAGNESIUM MYRISTATE, TRIETHOXYCAPRYLYLSILANE, O-CYMEN-5-OL, PENTAERYTHRITYL TETRA-DI-T-BUTYL HYDROXYHYDROCINNAMATE, PHENOXYETHANOL, MAY CONTAIN/[+/-]: CI 16035 (RED 40 LAKE), CI 77163 (BISMUTH OXYCHLORIDE), CI 77491, CI 77492, CI 77499 (IRON OXIDES), CI 77891 (TITANIUM DIOXIDE)."